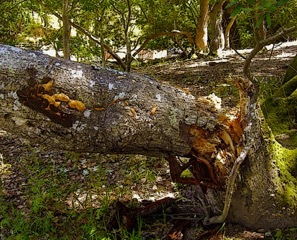 Forest Pathologist with UC Berkeley and expert in Sudden Oak Death Matteo Garbelotto reported that the number of Bay Laurels infected by Sudden Oak (SOD) has increased by 30% in Marin County in the past year. They anticipate that percentages in all bay area counties will be similar. Some experts say that the drought is partly responsible as it has overly stressed water-starved trees making them more susceptible to disease. Key information: The fungus (called Geosmithis pallida) that causes Sudden Oak attaches to the western oak bark beetle which is particularly attracted to drought stressed or otherwise wounded live oak trees. Female beetles lay eggs in tunnels they create and the larvae mine areas within the inner bark of the tree. Have your Oak trees checked. There is a preventative treatment that should be performed and now is the time.